Labor's attack ad on Malcolm Turnbull is grubby and cowardly. But it's no worse than the sort of rubbish that's been levelled at successive Labor leaders. 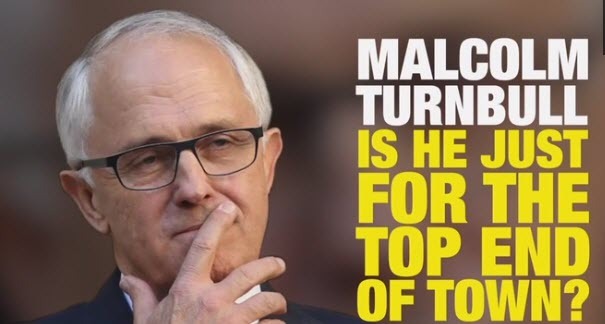 There's something very sordid about Labor's attack ad on Malcolm Turnbull. Not just in mentioning how he has "millions" in funds that invest in corporations that would benefit from company tax cuts -- presumably he is supposed to put all his money in a hole in the ground while Prime Minister -- but in the way it sneaks that line into an ad about company tax cuts and investment in schools and hospitals, insinuating, without having the guts to say it openly, that personal greed is the Prime Minister's motive. It's cowardly, and grubby. Australia doesn't have enough people like Malcolm Turnbull in public life -- people who've done more in their life than devote it to achieving political office, people who've been successful in other careers before entering public life. People who don't have to work at all for the rest of their lives, but choose to give it a go in public office, to endure the long hours and abuse that are part and parcel of being a politician. Yes, we know Turnbull's wealthy. So is Peter Garrett, who served three parliamentary terms, including two as minister, for Labor. Does anyone seriously think they're motivated by personal greed, compared to some apparatchik whose career consists of a steady progression from student politics to ministerial staffer to preselection to minister, who has lived and breathed politics since they were a teenager, as if that's healthy, and makes for a rounded individual. That describes many good politicians. It also describes an awful lot of poor ones, on all sides and at all levels.